Adding to the list of songs that are about ‘romance in the rain’, yet another similar scene was recently shot for the espionage thriller Aiyaary. The film that features Sidharth Malhotra as one of the leading protagonists is paired opposite Yaariyan fame actress Rakul Preet Singh. The two recently shot for a romantic scene in North India. Earlier we had mentioned that after completing a schedule in Kashmir, the team of Aiyaary had shifted to Delhi to wrap up yet another major portion of the film. While Sidharth Malhotra was busy with the promotions of A Gentleman until recently, he soon resumed the shoot in the capital post the release of the film. He was now seen shooting for this special love song outside a café in Gurgaon’s Cyber city hub. 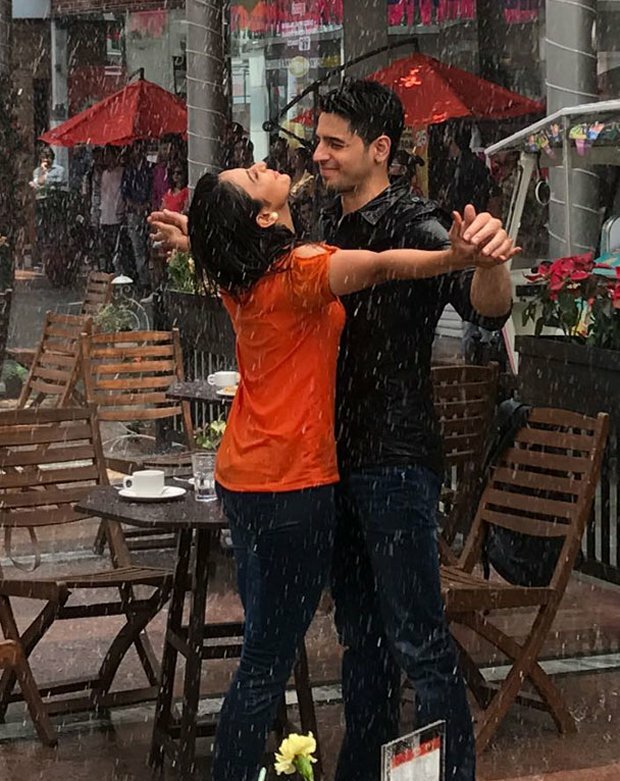 We came across this picture from the sets of the film Aiyaary which features Sidharth Malhotra and Rakul Preet Singh who are completely drenched to the skin whilst romancing in the rain. Let us tell you that this monsoon was engineered to shoot this romantic song sequence for the film. For the uninitiated, Rakul plays an IT professional in Aiyaary while Sidharth essays the role of an army officer. The drama is inspired by a true incident involving two army officers, both strong-minded individuals with completely different views. Manoj Bajpayee plays Sidharth Malhotra’s mentor in this military drama. Directed by Neeraj Pandey, Aiyaary is slated to release on January 26 next year, marking the occasion of Republic Day.